Harrison Ford has seen Solo: A Star Wars Story. Twice. Even though the actor who originally brought the character of Han Solo to life on the big screen decided to not attend the movie's premiere, that doesn't mean he hasn't seen it. But the real question is, what did the man who essentially is Han Solo think of the movie that doesn't feature him in any capacity? As it turns out, he is quite fond of it. 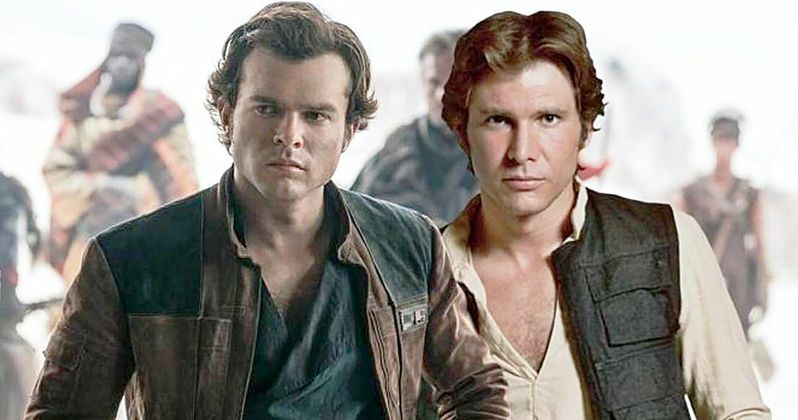 Director Ron Howard and Alden Ehrenreich, who had some mighty big shoes to fill in Solo, both spoke about Harrison Ford's reaction to the movie in a rather in-depth piece about the making of the latest Star Wars adventure. According to them, Ford has seen the movie twice and he "Adores" it. Not only that, but he feels that Ehrenreich managed to carve out his own space as Han Solo. Here's what Howard had to say about it. "I had never heard Harrison effusive about anything, and he was raving about it. He said, 'Alden nailed it. He made it his own.'" Indeed, especially in more recent years, it would be hard to describe Harrison Ford as effusive. That said, he does seem to be not only okay with Solo: A Star Wars Story, but he embraces it. He also seems to have a decent deal of affection for Alden Ehrenreich. A video recently surfaced online of Ford crashing one of his interviews and the two seemed to really enjoy one another's company. Solo had a famously troubled production, with directors Phil Lord and Chris Miller being fired after having shot nearly the entire movie. Ron Howard was brought in after that and reshot 70 percent of it. Alden Ehrenreich would have had a very difficult task ahead of him under the best of circumstances. So, how did he approach the role? As he tells it, taking on Han Solo was like taking on a biopic in some ways. "Just like in a biopic, the main thing is that pretty soon into the movie you're really just involved with this story and these characters, and that's the most important thing. Your job is the same as in any other movie: to make the scene work and make it feel like a real person." As of this writing, Solo: A Star Wars Story holds a 72 percent approval rating on Rotten Tomatoes. That doesn't make it one of the most beloved movies in the franchise by any stretch, but it also isn't a disaster and Harrison Ford isn't the only one who seems to enjoy it. A great many of the reviews praise Alden Ehrenreich's performance, even if the movie has its flaws overall. Guess it's a good thing Disney signed him to a three-picture deal. It seems we haven't seen the last of Han Solo in a galaxy far, far away, and the new guy has Harrison Ford's seal of approval. This news comes fo us courtesy of Variety.